Earlier this year, Steve Dotto, Mike Vardy and I did a webinar about text expansion tools. 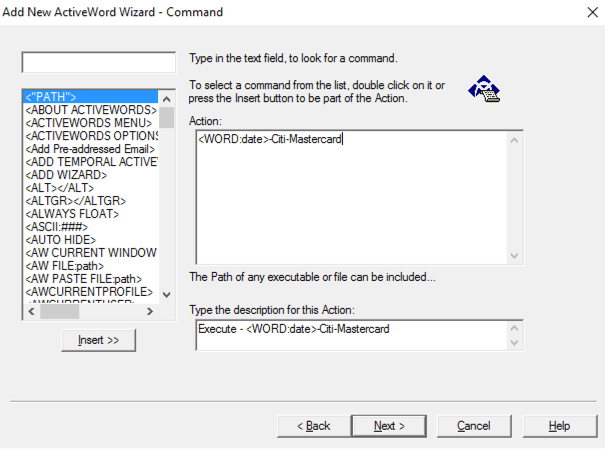 During the webinar, the creator of the Windows application ActiveWords (available here) told us that his solution is better than anything we were showing, so I decided to take a look and see what’s going on. I downloaded the ActiveWords 3.0 trial and started poking around. I have to say it’s a very impressive piece of software. For Mac users, you can think of it as a combination of TextExpander and Alfred. Not just a Windows text expansion tool, and not just a file launcher. This is not an exhaustive review or tutorial of the software. 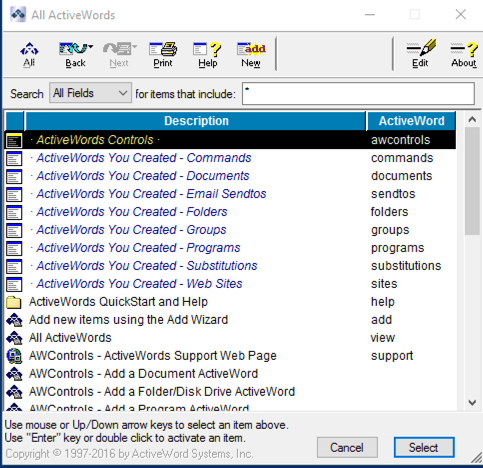 ActiveWords is one of those applications that can do a million things on your Windows computer and people who use it swear by it. I am specifically looking at the application in the context of going paperless. 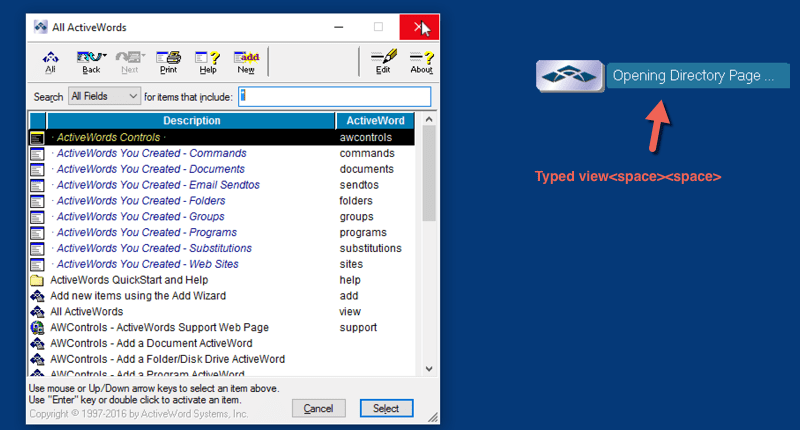 When you install the software, the floating ActiveWords Icon will appear on your desktop. You can move it to anywhere you’d like, dock it to the side of the window, change the opacity, or even disable it altogether. When you left-click on the ActiveWords Icon, a listing of all your shortcuts is brought up. You can find, select, and modify them from here. You can also right-click on the Icon to add/find shortcuts or to access settings. If you want to disable the Icon (I did. I am not a fan of floating icons), you can do all of this through the Notification Area in the bottom-right of your Windows desktop or, of course, access all these commands through ActiveWords shortcuts. As you’d expect, everything in ActiveWords revolves around typed commands (or if you have a tablet that supports it, you can write the commands in Ink(!)). Your question probably is: how does it know that I want to execute a command vs. just typing the word view in an email or document? The solution: you use a trigger, which by default is the F8 key or to hit the space-bar twice. Note that you don’t have to use these triggers. You can also configure commands to execute instantly, which I’ll look at in the next section. I first became interested in ActiveWords as a Windows text expansion tool. 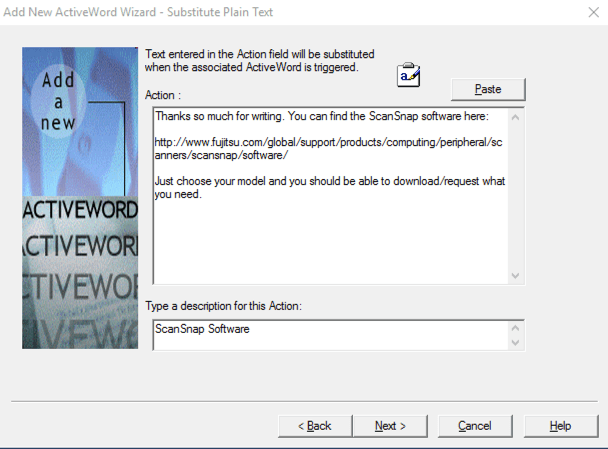 Longtime DocumentSnap readers will know how much I love text expansion tools such as TextExpander on the Mac, so let’s create some similar snippets on Windows. 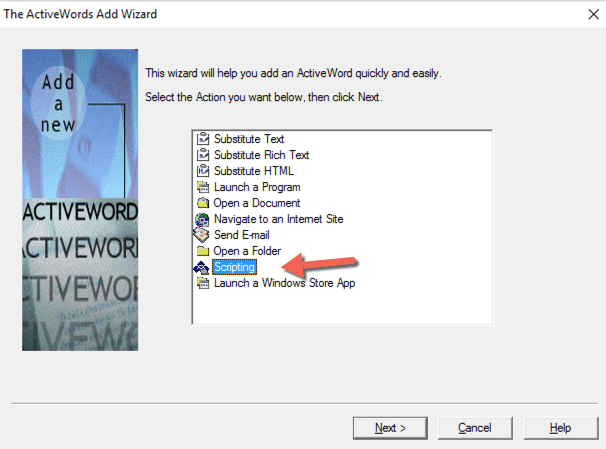 To create a new snippet, right-click on the ActiveWords Icon and choose Add new ActiveWords…, or just type the add command. You’ll be prompted with a wizard where you choose what type of command you want to create. In our case we want to choose Substitute Text and hit Next. After I hit Next, I enter the command that I want to use to exit this snippet. I will use sssoft as it’s not something I would otherwise type. I check Trigger instantly because I want it to replace this information as I type. Hit Yes if it asks you if you are sure. When I hit Finish my new snippet is created. If you are experienced with other text expansion tools, there is one subtle difference with the way ActiveWords triggers work. They are not exactly “instant”. ActiveWords Trigger Instantly triggers watch for the text that you type, but they also watch for a delimiter. By default this can be any of a space, a period, a comma, an Enter key, or any other punctuation (you can configure it if you want). Not a big deal, you get used to it pretty quickly. But just something to keep in mind if you are used to having text snippets instantly translate. Text expansion tools are killer for naming paperless documents. They save time and allow us to have a consistent and descriptive naming convention. ActiveWords can insert the current date, but you need to grab the Inplace Add-In from here. Once you install that, you can adjust the date format to be YYYY-MM-DD so when you type date you get the current date. Create a snippet just for the Citi-Mastercard.pdf part (let’s call it cmc) so that when we rename the file we type two snippets: date and then cmc. We chain the snippets together, so we create one cmc snippet that does both. Door #2 is a bit more complicated, but sounds more fun so let’s do it. In this case we create a new command like before, but this time we create a Scripting command. Next we use a special command called WORD. 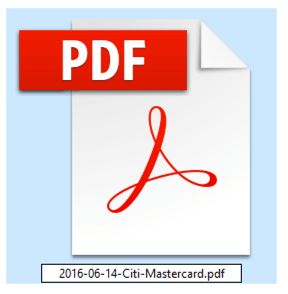 Since we know we already have that date command, we will call it and then put our -Citi-Mastercard.pdf after it. We’ll give it a shortcut of cmc and set it to trigger instantly. 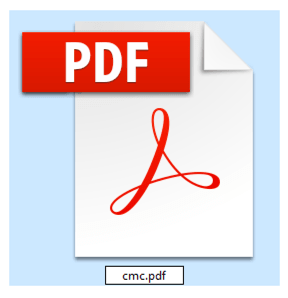 Now when I rename a PDF, all I need to do is type cmc and it’ll put today’s date and the consistent and descriptive filename I’m looking for. ActiveWords will let you create shortcuts to specific files and specific folders, but what if you want to use it to search? 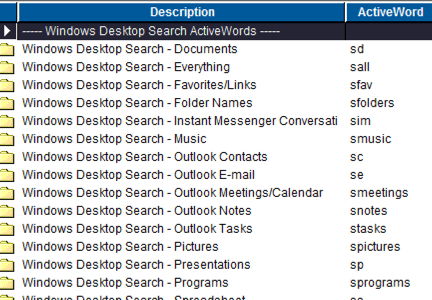 It doesn’t have file search built-in, but fortunately you can download the Windows Desktop Search add-in. Just go to the Add-ins page and find the WDS add-in and install it. Once you have it, you can type the wds command to see what you are able to search for. 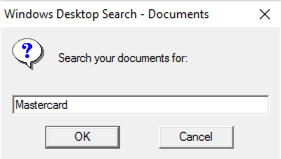 In my example, I will use the sd command to search for documents, which will bring up a search box. I’ll type Mastercard. 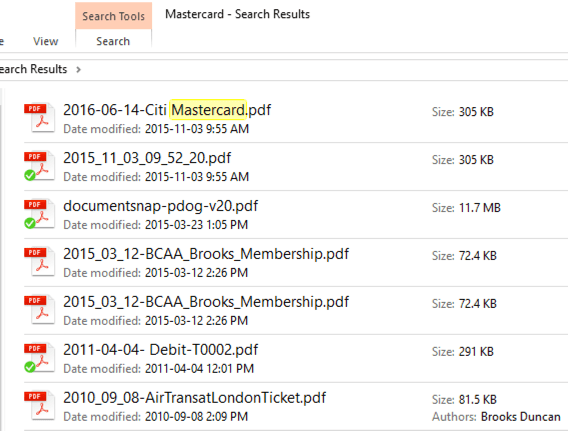 I search results box will appear that includes everything with the word Mastercard in the name or contents. You can mix this with Windows Search commands. For example, if I just want files with Mastercard in the name, I can search for name:mastercard. There’s my PDF that I renamed earlier in the article. The ActiveWords team has created an Evernote Add-in that lets you control Evernote (you have to, of course, have the Evernote Windows client installed). 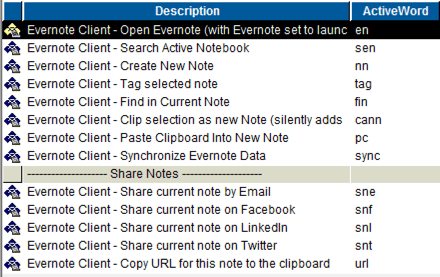 You can type evernote to see a list of the things you can do, but it includes searching your notes, tagging, and sharing. One feature of ActiveWords that at first I found annoying but came to appreciate is it watches which applications you launch and suggests shortcuts for you. Very quickly you’ll have your most-used applications all shortcutted up semi-automatically, which will let you quickly launch your programs with a few keystrokes. You can manually create these shortcuts of course. Just create a new shortcut and choose the Launch a Program action. I’ll just come out and say it. ActiveWords is not a pretty application. It reminds me of something I used to use back in the Windows 2000 days. It is also not as “smooth” (for lack of a better word) to set up and use as something like TextExpander or Alfred on the Mac. Part of that might be due to platform though. On the flipside, it is extremely functional and there are options to control almost everything about it. You can do a lot of customization to get it to work just the way you do. The more I used it on my Windows machine, the less I cared about the looks and the more I liked it. I can see why it has such big fans. As I said at the beginning, I don’t even scratch the surface of what ActiveWords can do, but as a productivity application it is an extremely powerful one. 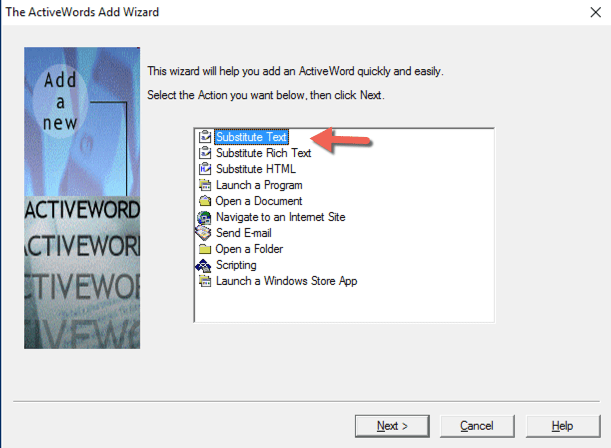 ActiveWords has a 60 day free trial and then has a $30 USD annual license. My experience is that breevy is fastest and results in no system lag, but lacks pop-ups to remind you of the abbreviation. Otherwise, it would be perfect. Never had a crash or issue. Active words is very good but has crashed rarely. Phrase expander has the looks /better UI and is very similar in many ways to activewords. The issue I find is that it slows the system down quite a bit. Could be due to the way it is coded. It has a more modern interface than Activewords (and it’s constantly updated). It displays suggestions as you type (thanks to our exclusive SmartComplete technology), and you can use it to create fill-in-the-blanks templates. Please let me know if you are interested in a comparison review. How does ActiveWords compare w/ Breezy?